A fairly recent addition to LEGO CUUSOO is this midi-scale model of a fire truck, built by Ralph (aka Madphysicist). It was on display at this year’s LEGO Show, along with his other models of a police car, ambulance and helicopter (seen at the end of my LEGO Show video!). This model is reminiscent of the old Model Team sets, of which I have a vague memory: I remember building the Hot Rod (10151) with my dad many years ago, although being a very destructive kid it didn’t last very long. Anyway, this model, along with Ralph’s other midi-scale vehicles, turned out to be very popular with the kids at the show, and got quite a bit of love on the Internet – so much so that he decided to put it up on CUUSOO. The response has been pretty good, currently standing at 115 supporters. 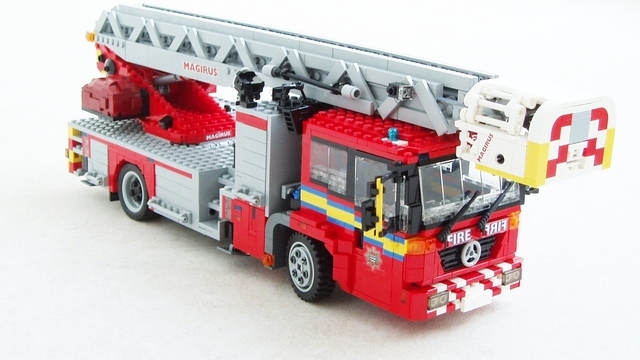 This would make a great set for anyone interested in emergency vehicles, or simply as something to pass the time, and it makes very good use of parts. I don’t think there’s currently anything like this (outside of Technic) for sale.